Do you have important WhatsApp conversations on your iPhone 6, 6 Plus, 6S, 6S Plus, or iPhone 7/8/X that you want to save or read on your PC? 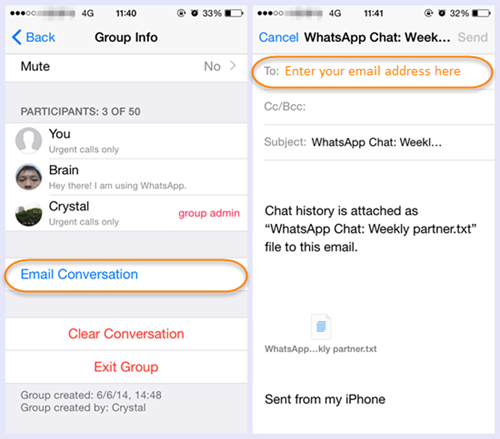 If yes, Here the tutorial will demonstrate two approaches for iPhone users who wish to backup WhatsApp chats and read them on computer. Backup iPhone WhatsApp messages to computer via email will have a simple process to follow. 1. Open the WhatsApp conversation you want to save. 2. Tap the contact’s name or group subject in the navigation bar. 3. Scroll to the bottom and tap Email Conversation. 4. Select if you want to Attach Media or email the conversation Without Media. 5. Enter your email address and tap Send. Your chat history is attached as txt file to this email. 6. Log into your email account on computer and view your WhatsApp chats. iPhone users using iTunes to transfer WhatsApp messages from iPhone to computer will have two processes. Either way, you’ll make sure your computer has the latest version of iTunes installed. The first part is incredibly simple. Connect your iPhone to computer via USB cable and launch iTunes. Go to File > Devices > Back Up to create a backup of your phone’s content. Note: You’d better create an unencrypted backup as the free extractor in the second part cannot extract and save data from encrypted backup. The second part need a third-party tool. Download iPhone Backup Extractor and install it on your computer. 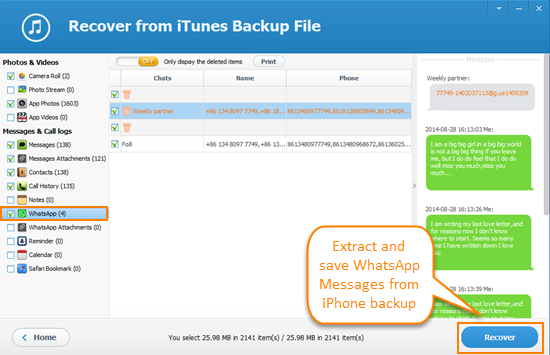 The freeware allows you to extract WhatsApp messages from iTunes backup. You can save and view the chat history on your PC with a single click only. 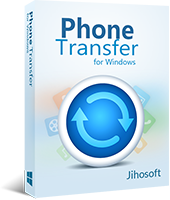 Run Jihosoft iPhone Backup Extractor Free on your PC. Select the backup containing your WhatsApp chats and click “Next”. Select WhatsApp and WhatsApp Attachments from the listed file types, then click “Next” to beging scanning. When the scan is completed, you can preview and check the WhatsApp messages in detail. Mark those you want and click “Recover” to save them on your computer in HTML for easy viewing. Hope this tutorial will help you in backing up WhatsApp messages from iPhone to computer. For those of you who want to transfer text messages from iPhone to computer for backup, this freeware can also do a help. If you are switching to a new phone, whether it’s an iPhone or Android, you can get your WhatsApp messages to the new device with the help of phone data transfer tool.